FAYETTEVILLE, Ark. – A recent survey by the national Chronicle of Higher Education ranks the University of Arkansas as the 13th-fastest growing public research university in the country, in terms of enrollment. 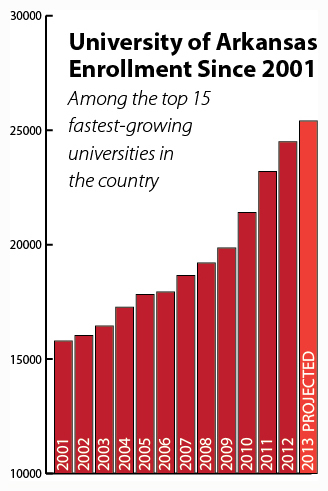 The ranking is based on enrollment figures covering the decade between 2001 and 2011. According to the survey, during that period the university’s enrollment grew from a total of 15,752 students to 23,199 — an increase of 47.3 percent. “Everyone on this campus knows that we have been experiencing phenomenal growth since 2001,” said Chancellor G. David Gearhart. “This survey, however, provides us with a national context and perspective and makes our growth that much more impressive. This is a credit to our faculty and staff, who make the University of Arkansas a first-choice school for great students in Arkansas and in the rest of the country. University enrollment is expected to reach at least 25,000 students for the fall 2013 semester. That amounts to 59 percent growth since 2001. The increase is the result of careful planning, said Suzanne McCray, vice provost for enrollment management and dean of admissions. "The growth reflects the University of Arkansas’ long-range plan to expand access to higher education in the state and to continue to build a national reputation of excellence that attracts students from around the world." Only one other university in the Southeastern Conference had a faster growth rate than the University of Arkansas – the University of Alabama was ranked fourth, with a growth rate of 65.4 percent.